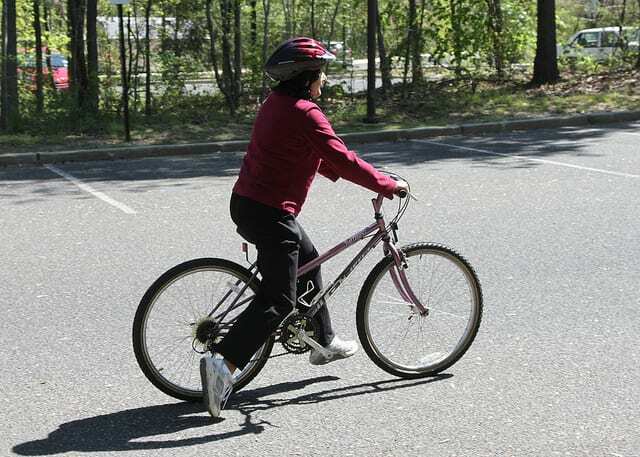 Princeton Adult School’s fall course list includes several sports and outdoor recreation classes, including a “learn to bike” class for adults, a bicycle repair and maintenance class, hiking in New Jersey and more. The “learn to bike” class, taught by the founder of Bike Exchange, comprises four one-hour classes on Saturday mornings. The four-session bike maintenance class will be held at Harts Cyclery on Route 31 in Pennington. 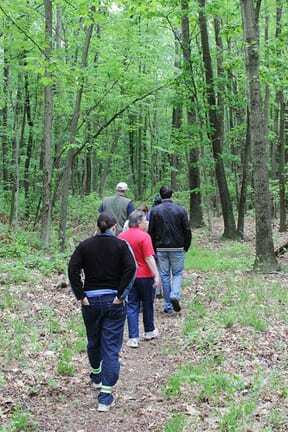 The hiking class will take participants to four different areas of the state on Saturdays. There’s also a separate class that spends an October morning exploring the woods at the Institute of Advanced Study with a professor who has studied the woods for more than 40 years. Details on all courses are on the Princeton Adult School website. Among the amazing number of recent achievements, the Alexander S-Curve ranks high. Starting at the Delaware and Raritan Canal, the new roadway includes bike lanes on both sides and a sidewalk on the south side of the road. The road was the site of a fatality several years ago, and the construction was delayed to avoid concurrence with the Meadow Road project. Thanks to the township for their very busy year and all the great results! 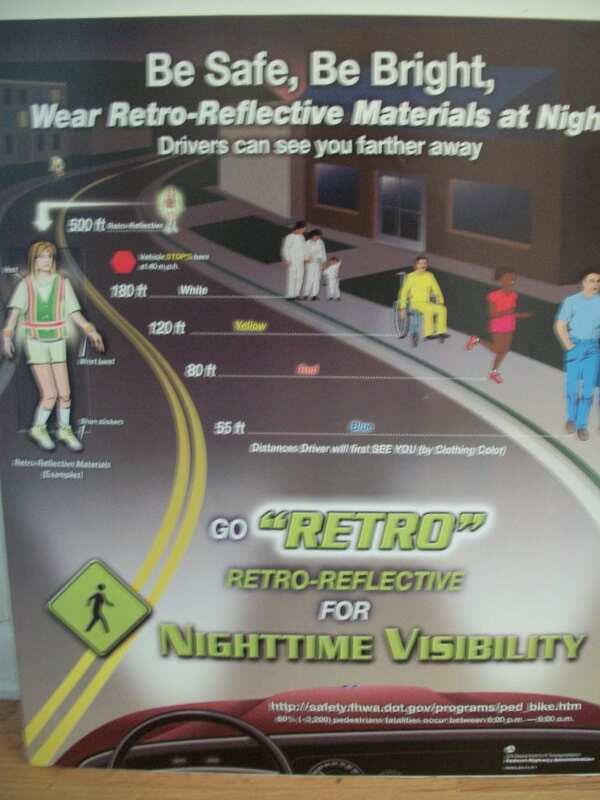 The WWBPA partnered with the Princeton Joint Bicycle and Pedestrian Advisory Committee to promote nighttime visibility recently, at St. Paul’s church in Princeton. We were able to take advantage of their excellent audio/visual facilities in the basement meeting room, with about 15 people attending. 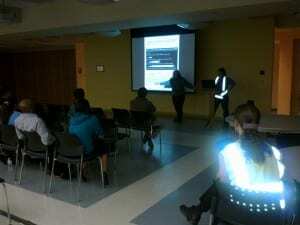 one of our members, who gave the safety presentation in Spanish, and was very good at engaging the audience. Thanks also to the Hunterdon Area Resources for Transportation (HART) Transportation Management Association, who developed the base of our bilingual presentation. 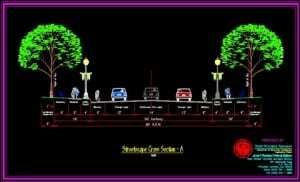 What’s a sharrow? A shared-lane marking when it’s just not feasible to install a full bicycle lane. You can read about their success elsewhere here. 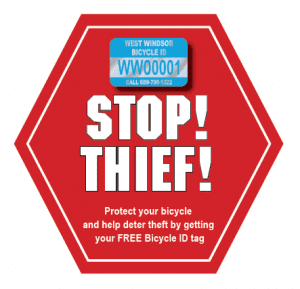 Unlock those bikes and come ride on the bike sharrows! Cyclists and skateboarders, all ages, all skill levels are invited to take part in a short ride along the newly marked sharrows along Princeton’s streets. Bike for the environment, bike to support the BYOBag campaign or just bike for fun… but please join us to show that we love the new Sharrows and look forward to more support for healthy, sustainable, fun-loving bikers and skaters. 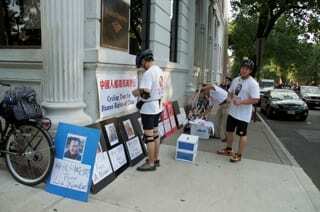 The more people who attend the ride, the bigger the statement. Paul Robeson Place/Wiggins Street/Hamilton Avenue from Bayard Lane to Snowden Lane. Sharrows are shared lane markings that are being used in New York City, among other places, and were included for the first time this year in the Manual of Uniform Traffic Control Devices, a bible for transportation engineers. 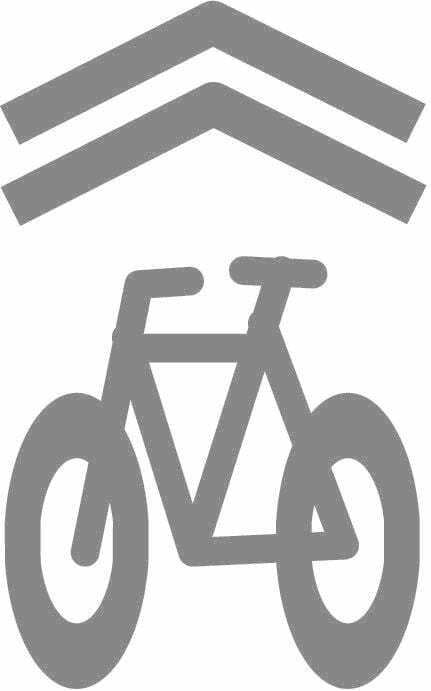 The markings depict a bicycle with directional arrows and are highly visible to motorists and help guide bicyclists to an appropriate place in traffic (and far enough from the risk of hitting an opening car door). The advisory committee says sharrows are needed to fill the gap between sidewalks for novice cyclists and off-road trails for recreational cyclists. Those using their bikes for transportation (to Princeton University, the Dinky, downtown, and shopping centers, for example) and seeking direct routes currently are left out. Sharrows would work on Princeton’s narrow streets, where parking is a priority and there is no room left for bike lanes. 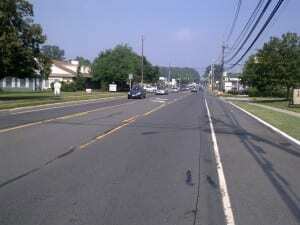 In its report, the committee wrote that “shared lane markings may be the only feasible and affordable intervention to improve the safety and comfort of cyclists on Princeton streets.” It noted that the four roadways it recommended for sharrows are where 60% of the bicycle accidents from 2008 through May 25, 2010 occurred and estimates that adding these markings to the road will cost $13,000 for every two miles of roadway. 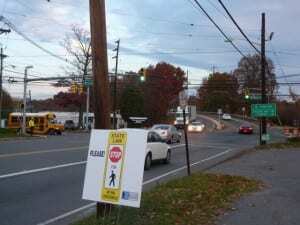 The Princeton Joint Pedestrian and Bicycle Advisory Committee Sharrows Policy Paper was presented to the Princeton Borough Council last week, and it isn’t clear when the borough and township will decide whether to follow the recommendations. The West Windsor Bicycle and Pedestrian Alliance hopes that both will evaluate these recommendations seriously. 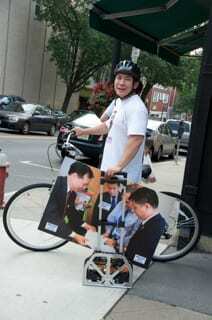 Comments Off on Sharrows for Princeton? 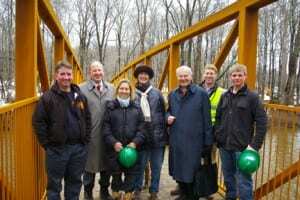 After 15 years of work, the Stony Brook Regional Bicycle and Pedestrian Pathway and Bridge Project in Princeton is completed! 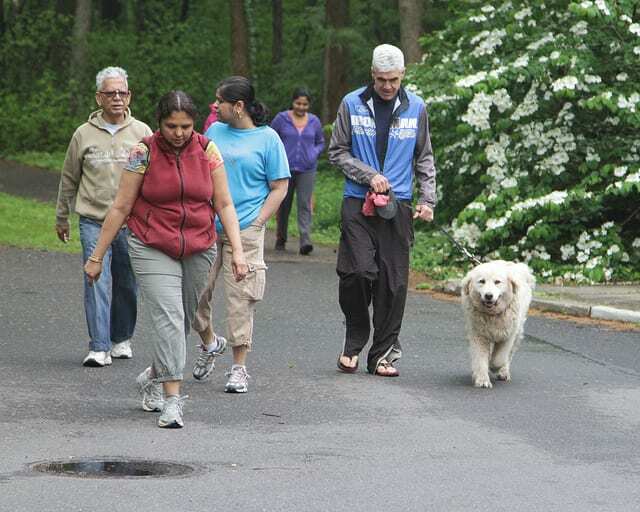 Critical links were added this year, and bicycle/pedestrian bridges and pathways now connect the Princeton Battlefield and Institute Woods area to Mountain Lakes Preserve and Woodfield Reservation in Princeton. 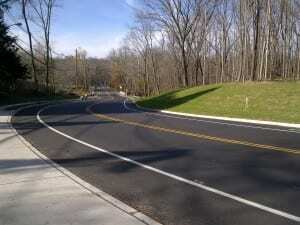 The new pathways and bridges can be accessed from Rosedale Road at Greenway Meadows Park or from Route 206 at Hutchinson Drive, north of the service entrance to TPC Jasna Polana. A dedication ceremony is planned for Sunday, October 3. 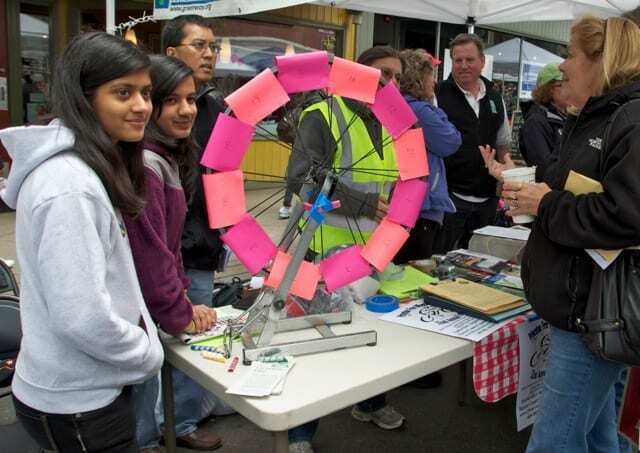 The celebration will take place at 4 p.m. at the 125-foot bridge across the Stony Brook. Parking for the celebration is also available at the Hun School Athletic Complex parking lot off Winant Road. 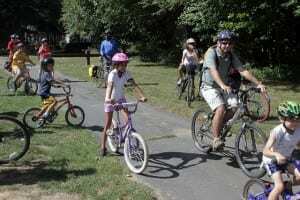 Those wishing to walk the new trail or ride the bike route to the celebration should meet in the Greenway Meadows Park parking lot across from Johnson Park School at 3 p.m. Steve Hiltner, naturalist for Friends of Princeton Open Space, will lead a 30-minute walk. 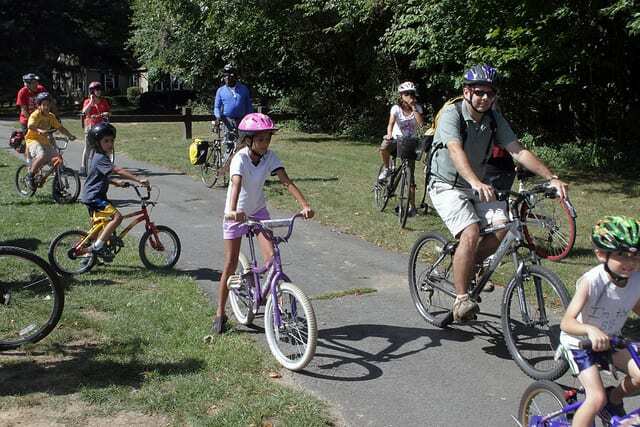 Members of the Princeton Joint Pedestrian and Bicycle Advisory Committee will lead the ride along the bike route, also at 3 p.m.
More information is available from the Friends of Princeton Open Space. See our previous post about the Stony Brook Recreational Trail.